Albany State picks up a pair of awards this week. 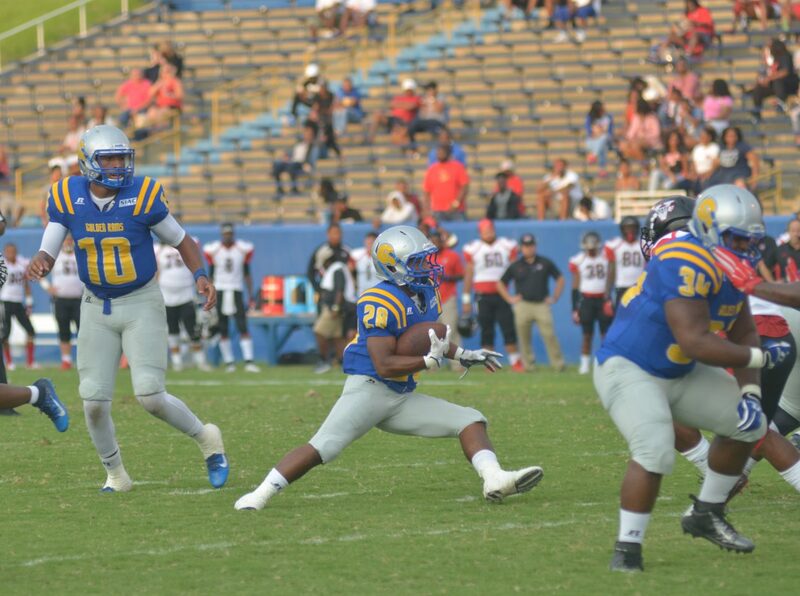 ATLANTA, Ga—Chancellor Johnson (Albany State) was named SIAC Football Offensive Player of the Week, while teammate, Marquez Thomas earned Defensive Player of the Week, released by the league office on Tuesday. Dalton Hall (Tuskegee) was also tabbed Special Teams Player of the Week alongside Michael Sims (Morehouse) who earned Newcomer of the Week. Redshirt Freshman, Johnson, led the Golden Rams to their first win over Tuskegee since 2010 as ASU defeated the Golden Tigers 20-7 at the Fourth Annual Whitewater Classic in Phenix City, Ala.
Senior, Thomas, a native of Perry, Ga., led a stingy Golden Ram defense that pitched a shutout over the final three quarters in ASU’s win over Tuskegee. ASU only allowed, 27 plays from scrimmage, 2 first downs and 119 yards of total offense, and Thomas led the way with 6 tackles (4solo) including a sack for a loss of 8 yards and a quarterback hurry. Tuskegee’s Dalton Hall punted the ball six times for 275 yards. Hall finished with three punts +50 yards with the longest being a 54 yarder while averaging 50 yards per punt. He was 1-for-1 on his point after touchdown (PAT) which kept the Golden Tigers in the game defensively until after a late 3rd quarter touchdown from the Golden Rams which made it a two possession game. Freshman, native of Detroit, MI, came in as relief of the injured starting quarterback and engineered two scoring drives to put the game out of reach and allow Morehouse to defeat Lane, 24-10. Sims completed 8 for 13 (61.5 pct.) for 117 yards with his longest being 39 yards.